Celebrate Earth Day in Delco! This year marks the 49th anniversary of Earth Day, held on April 22. This year’s theme is “Protect Our Species.” All living things have an intrinsic value, and each plays a unique role and we must work together to protect endangered and threatened species and the resources that we all share. 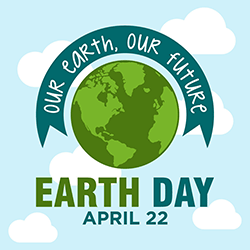 We encourage all of our residents to participate in Earth Day and participate in a project in your community or in your own backyard. Delaware County, presently consisting of over 184 square miles divided into forty-nine municipalities is the oldest settled section of Pennsylvania.